"And this is a simple matter in the sight of the Lord; He will also deliver the Moabites into your hand." McRaven’s three-year tenure has been a tumultuous one. While McRaven laid out an ambitious agenda, McRaven became mired in politics after a failed $215 million purchase of 300 acres of land in Houston for a UT campus as well as McRaven’s opposition to the state’s “campus carry” law passed two years ago. Sources said Abbott and Patrick, but specifically Abbott, who signed SB11 into law (effective Jan. 1, 2016) allowing those with concealed handgun licenses to carry on college campuses, resented McRaven for his outspoken stance that the law would make campuses less safe. Reports on social media surfaced a person with a concealed carry license drew a firearm to stop a suspect accused of three stabbings (including one fatality) on the UT campus on May 1 from further attacks. But police wouldn’t confirm those reports and credited an officer who arrived two minutes after being called with stopping the attacker. As far as McRaven leading the UT System’s purchase of 300 acres for a UT campus in Houston, I'm told he did so without clearing it with key Houston politicos, including Abbott and Patrick (both from Houston), as well as key Houston legislators who have to answer to the University of Houston in their districts. I’m told McRaven didn’t even involve UT president Greg Fenves before the land purchase, which became a bit of a political minefield for Fenves while the Big 12 was exploring expansion a year ago. Sources said Houston lawmakers put pressure on Texas to help the University of Houston get into the Big 12 as a way of making up for - or even in exchange for - McRaven’s purchase. Fenves played the situation perfectly, announcing in a tweet that if Houston was to be considered for the Big 12, UH would make a great candidate. In the end, the out-of-state members of the Big 12 didn’t want another school in Texas added to the league. McRaven abruptly abandoned the land purchase, announcing earlier this year the UT System would sell the property after McRaven was undressed in a public forum by UT regent Kevin Eltife, a former state senator from Tyler and perhaps Abbott’s closest confidante on the regents board. It's very subtle. And, unless you understand UT politics, you might miss it. But it's difficult to overstate the magnitude of what just happened. Then there's the fact that this report appeared in the sports media, instead of the political media. One of the ways the U.T. politburo keeps the alumni at bay is via Pravda-esque levels of manipulation of media coverage of the athletic department. We've never had a reason to discuss it publicly, but we have personal experience attempting to cover the athletic department to back this up. The result is to create a fan-boy media culture that echoes the Politburo line. But by leaking to the fan-boy sports media, instead of the Trib or the Statesmen [Note: How much egg do those two have on their face after getting scooped this big?!? ], Abbott is essentially telling the politburo "if you guys don't shape up soon (*), I'm about to start taking my case directly to the alumni." 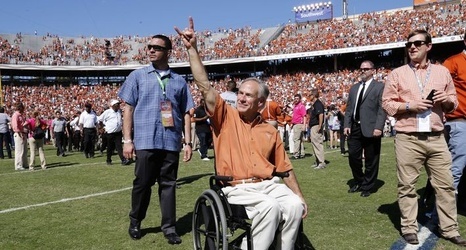 That being said, this is still Greg Abbott (and UT) about whom we're talking. So it shouldn't surprise anyone if follow though is lacking. But if you know what to look for, this is pretty huge. Bottom Line: An Abbott-appointed regent leaking this sort of a BOMBSHELL to the athletic department's fan boy media doesn't happen by accident. Then there's this: "But sources close to Fenves, who earns $750,000 per year, indicated Fenves has “three to five years” of agenda items he wants to help carry out as UT president." Considering that Fenves has already been there 2.5 years, does that mean they're laying the foundation for his departure along with McRaven at the end of the current school year?! ?